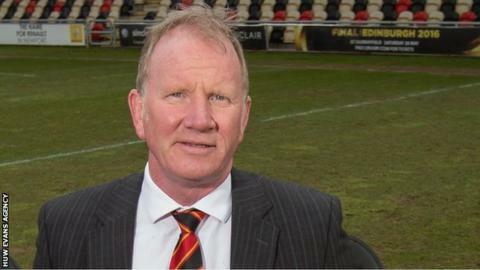 Chief executive Stuart Davies says he is "busy" dealing with "approaches" from potential new backers of Newport Gwent Dragons. The region wants new investment under plans that would see the Welsh Rugby Union relinquish its 50% stake. Davies said follow-up meetings with "interested parties" are in the pipeline. But he was disappointed by ex-Wales captain Gwyn Jones' recent call for Dragons to become a "development" team. Dragons finished in 10th place in the Pro12, one place ahead of Zebre despite winning a game fewer than the Italian side. The Welsh region finished ahead of them after picking up 10 losing bonus points during the season. Dragons parted company with director of rugby Lyn Jones in April and head coach Kingsley Jones will remain in charge for at least 2016-17. Before the season ended, Gwyn Jones told Scrum V: "It wouldn't be a bad thing if they were to become more developmental in their philosophy." Davies said he had "absolutely no problem with the observation that it's been a very poor season for the Dragons". The former Swansea number eight added: "But I was very disappointed with the context, really because whilst Gwyn was saying that we need change, I also felt he'd probably been on a desert island for the last six weeks because there was no reference to the change that we're actually instigating. "So I share his feelings around us needing to improve - that's not an issue at all. "But certainly in the context of what we've announced this year, I don't think we can do more than we currently are in terms of showing our ambition and our desire as much as anyone to improve performances on the field."